Interested in learning how abrasion resistance can lower maintenance costs in exterior aircraft lighting systems? 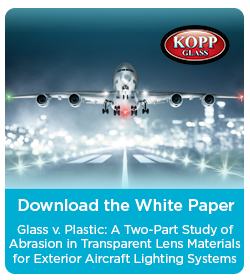 Check out our two-part study, comparing borosilicate glass, polycarbonate, and aviation grade acrylic. Do you need to create complex, custom glass components or lenses? Our integrated manufacturing facility can support you from idea to design to production. For 90 years, we have manufactured technical glass that meets the demanding requirements of diverse industrial, technical, and commercial applications. Our glass engineering capabilities and precision molding expertise enable you to see your innovative idea come to life. As a fully integrated glass manufacturer, our team of optical, material, and glass engineers are on-site and collaborate closely with our production teams to create high-quality parts on-time and in-spec. With more than 200 active glass compositions available, you’re sure to find a glass that meets your requirements. Use our spectral calculator to select the right filter glass for your application and to calculate transmittance data at specific wavelengths. Our team of glass and material scientists, optical engineers, and industry experts share their expertise with you on our blog, Glass Transforming Light. The introduction of new light-based technologies brings both exciting benefits and complex challenges to lighting engineers. Subscribe to our blog to learn how smart glass engineering can help you leverage these new technologies.